Untap Victory Chimes during each other player's untap step. : A player of your choice adds . 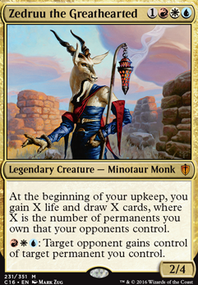 If you are looking for cards to take out, the primary cards I would look at: Martial Law - Only gets one creature, and is somewhat slow as a 4 mana do-nothing enchantment, while it can eek out value, it can also do very little Recumbent Bliss - Trading 1 for 1 with a single opponent sets you behind the other players, and I'm not sure the life gain is worth it. 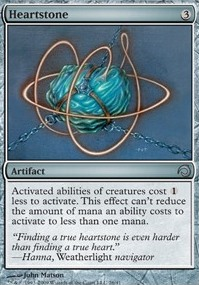 Ith, High Arcanist - Seems like it doesn't quite do near enough for its mana cost, and its suspend can be really slow. Like, if you have it on turn 2, great, but that may not happen often enough to be worth it. Icy Manipulator - Like martial law, but also you have to pay for it. It's by no means useless, but it's slow, it only works on thing a turn, and it might just do nothing for you. Mind's Eye - is super slow. Like, if you want to draw, lets say 5 cards, you have to invest 4 mana intially, and then 4 more mana over subsequent turns. Or, you could just cast Tidings and draw 4 cards for 5 mana. Victory Chimes - just meh. While you can dream of making cool deals for the extra mana, as someone who has played Spectral Searchlight , its mostly just a bad mana rock. 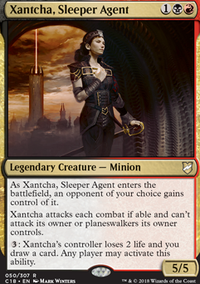 Victory Chimes is a relatively new and budget card from Battlebond that I feel would fit this deck very well. 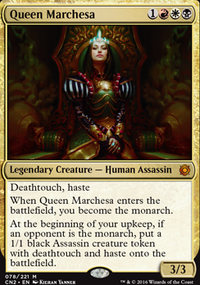 Thanks,TheNocholas, I thought about it and because I am going to buy the Rakdos Guild Kit, I decided to cut Victory Chimes and Harsh Mentor to add Whispersilk Cloak and Master of Cruelties . Oh, also, I think you could use a little more card draw. Syphon Mind is a personal favorite of mine. Sign in Blood , Night's Whisper , and Promise of Power are pretty popular, as well. 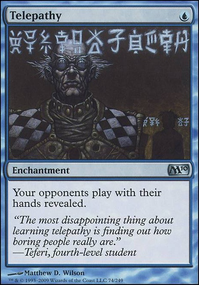 As for more ramp, you might like Victory Chimes as a political tool, and the Goad mechanic might also suit your needs. Get Disrupt Decorum and Grenzo, Havoc Raiser in there! Same for Goblin Spymaster . Hey, I am not very experienced with dedicated political decks but I had a few ideas for your deck. Homeward Path : You mentioned returning creatures to their owner as political tool. I think Homeward Path would be another good option for this and it costs only a land slot. Victory Chimes or Spectral Searchlight : These two would be great mana rocks for this deck. If you need the mana just use it for yourself. If you don't need it at the moment you could propably make a deal with someone. 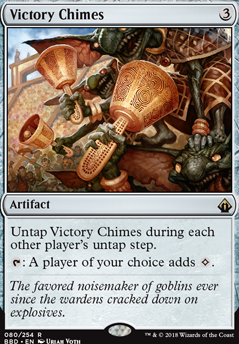 Victory Chimes are especially good because it untapps every upkeep. Play of the Game : It seems this would be a nice board wipe for your deck. Snap157 on Any ideas for Xantcha Politics? With Xantcha is you get infinite mana you can kill someone with her ability, so I would add in Basalt Monolith with Rings of Brighthearth, and she also comboes well with Neheb, the Eternal and Heartstone. None of these cards are super expensive [$5 or lower] as it looks like this deck is on the budget-ish side. I might still try to fit a Sol Ring in as getting off ramp spells a turn earlier is nice if nothing else.